Customers and clients love free stuff. Who doesn't? Even better is when your business offers free stuff that carries your identity, your motto, your logo. That's where we at Promotion Pros step in. With our customizable binders, your customers can take a piece of your business wherever they go. 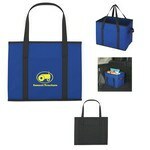 Our expanding file organizers are a great freebie for customers to organize their paperwork.